I love smoothies not only for their refreshing taste, but also for the amazing amount of nutrition you can pack into a cup. Smoothies are great as a breakfast-to-go or a post-workout recovery option for athletes. They are also a fun and approachable way to get fruits, calcium-rich foods and even veggies into kids and adults alike. I recently had the opportunity to teach nutrition to children between the ages of three and five at my son’s school. Most kids learn by doing versus telling so we prepared two recipes (one of which was smoothies). Kids are far more interested in trying something new when they are not forced and if you use fun names and plenty of enthusiasm. I was curious to see how kids would respond to “superhero smoothies” equipped with mango, pineapple, unsweetened juice and kale (the surprise superpower ingredient). When I enthusiastically pulled out the large bag of kale, most of the kids didn’t know what it was. I asked for their help to tear off the kale and prepare it for the smoothie, and without prompting, the kids happily began to sample it. We tossed the superpower ingredient into the blender and I am proud to say that 21 out of 25 kids loved the kale smoothie! The green smoothie trend has indeed caught on. 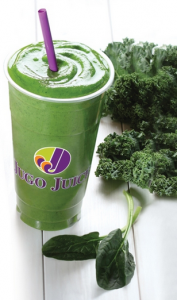 Jamie Vadori, marketing director for Jugo Juice, which specializes in healthy smoothies, says “the vegetable category of smoothies has gone from very small to the fastest-growing part of our business, with more than 100 per cent growth in each of the last two years.” Last week, based on the success of vegetable smoothies such as the Mighty Kale, Jugo Juice launched two new smoothies with cauliflower. “We are breaking down the boundaries that may have existed in the past by adding a number of non-traditional ingredients, such as kale, spinach, Swiss chard and even cauliflower into smoothies and making them taste great,” says Vadori. Regardless if you are blending a healthy smoothie on the go or buying one, building a healthy smoothie needs to start with healthful ingredients. Skip added sugar, sorbet and ice cream and instead go for smoothies made with simple ingredients. 1. Start with fruit: Try a mix of fresh or frozen unsweetened strawberries, blueberries, blackberries, raspberries, mango, orange, pineapple, banana, peach, watermelon and more. 2. Add a healthy liquid: Read your labels to make sure you are getting 100 per cent unsweetened fruit juice (such as cranberry, mango, apple, orange or pineapple) or fresh-pressed vegetable juice (such as carrot or beet juice). Skip what I call juice impostors (fruit punch, fruit drink, fruit beverage and fruit cocktail), which contain added sugar. For lower-calorie smoothies, try water, coconut water or chilled brewed tea to blend. Use milk or calcium-fortified almond milk, soy milk or rice milk for added calcium and vitamin D.
3. Consider a veggie: Fresh kale, spinach, Swiss chard, avocado, cucumber, as well as steamed veggies such as cauliflower, carrots and beets. If you have a professional blender such as a Vitamix feel free to experiment with adding harder, raw veggies. 4. Try a healthy addition: Hemp hearts, chia seeds and ground flax are all great. If you are wondering which of these three is best, it just depends on which type of benefit you are looking for (read more here). Hemp hearts contain the most protein and also some iron and zinc. Chia seeds contain the most fibre and also some calcium. Ground flax seeds contain the most heart healthy omega-3 fat. Try adding yogurt, cottage cheese, tofu or protein powder for extra protein. Oatmeal, bran, wheat germ or breakfast cereal can be added for more fibre. 5. Blend and enjoy three ways: Serve immediately at home in a cup or martini glass. Sip on the go in a reusable coffee mug with a straw. Or freeze into Popsicle containers and enjoy later.